U.S. strategic assessments like the 2010 Quadrennial Defense Review, the 2010 National Security Strategy, and the Director of National Intelligence’s annual threat assessment have placed natural resources, climate change, population, and poverty squarely on the American security agenda. But are these broad statements in doctrine and threat assessments translating into tangible changes, such as new approaches to the education of future military officers? My colleague Sean Peoples and I recently spoke with faculty and cadets at the U.S. Military Academy about how West Point’s Geography and Environmental Engineering Department is integrating these issues directly into their curriculum. “I want them to think about the bigger picture,” said geography professor Amy Krakowka. “West Point’s geography curriculum requires cadets to complete an integrated analysis using a checklist that works up from the basic physical landscape of an area to the larger-scale human and cultural geography of a region.” We’re trying to “put people into the decision-making process,” she said. Though some students are skeptical at first, Krakowka said she has already received requests for the checklist tool from former students now deployed overseas in active theaters. “The military is engaged in many, many varied operations, many of which have nothing to do with combat, many of which are simply aimed at building bridges between populations,” said LTC Lou Rios USAF (Ret. ), who taught at West Point before retiring from active duty this year. Trained as a meteorologist, Rios taught climate change and energy issues as part of environmental security courses. Rios also paid multiple visits to the Wilson Center to discuss integrating environment and demography into the West Point curriculum. One tangible outcome of these visits was ECSP hosting two honors cadets as summer interns, something we plan to do again in 2011. 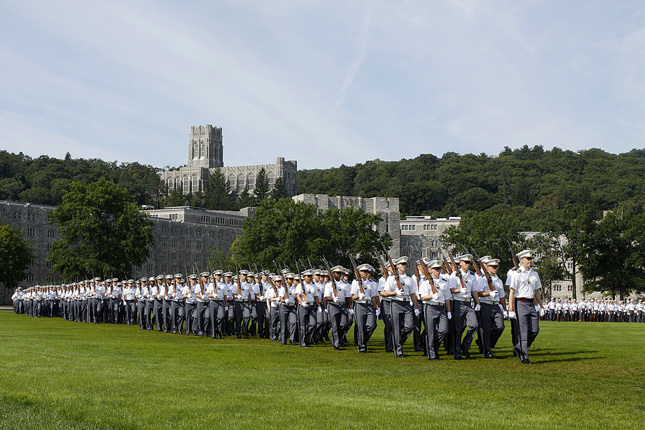 Photo Credit: Acceptance day parade at the U.S. Military Academy at West Point, courtesy of the U.S. Army.